do not leave us as orphans, Lord. Lord and Lover of mankind! and the powers of heaven did not cease singing the thrice-holy hymn. as the only-begotten Son of the Father. In the multitude of Your bounties, have mercy on us! Men of Galilee, why do You stand looking to heaven? He will come again in the same way. Serve Him in truth and righteousness! enlightening those in the shadow of death with the light of the Gospel! that they might obtain from Christ our God peace and great mercy. humbling the fierce pride of Islam! who in silence received the fruits of the Spirit. Through their prayers, Christ our God, grant us great mercy. Cyril, who chose to live with wisdom in his youth. and Methodius who renounced the things of this world for love of Christ. He strove like an angel for the kingdom of heaven. receiving from Christ our God great mercy! With what spiritual songs shall we magnify you, most blessed teachers? For the sake of the salvation of the Slavs you became equals to the apostles. opening for them the door of the written Word. receiving from Him peace and great mercy. 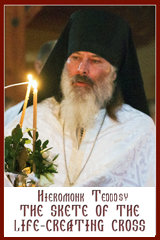 the pride of hierarchs, the enlighteners and fervent intercessors for the Slavic people! closing the blaspheming mouths of Islam! You assisted him with prayers and miracles. for those who praise you with faith and love! trampling down death by death. You ascended in glory, filling all things! that we may praise and glorify Your divinity. Our God is in the heavens and on earth * He does whatever He pleases! verse: Judah became His sanctuary, Israel His dominion! verse: The sea looked and fled, Jordan turned back! has enlightened the Church like the stars. The strength of your teaching has brought many nations to Christ. and now you dwell with the angels. Therefore pray for us who honour your blessed memory! Let Your priests be clothed in righteousness, and let Your saints shout for joy! equals-to-the-apostles, and the glory of the Slavs. and learning the eternal Word which cleanses us from the darkness of sin. The mouth of the righteous speaks wisdom, and his tongue utters justice! sweet voices of the Holy Spirit! that He will deliver our lives from corruption, as the greatly merciful One! Rejoice, blessed ones who enlightened us with the knowledge of God! you quenched the thirst of the Slavic people! now you stand in the glory of Christ. as we magnify you throughout the ages! the splendor of the Father’s glory! We bow in worship before Your Passion! We magnify Your glorious Ascension! As equals to the apostles in the way you lived* and teachers of the Slavic lands,* O Cyril and Methodius, divinely wise,* intercede with the Master of all* to confirm the Slavic nations in orthodoxy and oneness of mind;* to grant peace to the world and save our souls. You ascended in glory, O Christ our God,* giving joy to Your disciples by the promise of the Holy Spirit,* and assuring them through Your blessing* that You are the Son of God,** the Redeemer of the world. Clap your hands, all you nations;* shout to God with the voice of joy. Through the prayers of the Mother of God, O Saviour, save, us. For the Lord most high is awesome,* a great king of all the earth. He has subdued peoples to us,* and nations under our feet. God ascended amid shouts of joy;* the Lord at the sound of the trumpet. Come, let us sing joyfully to the Lord,* let us acclaim God, our Saviour. 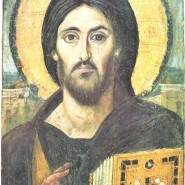 Son of God, who ascended in glory,* save us who sing to You: Alleluia. Let us come before His face with praise,* and acclaim Him in psalms. For God is the great Lord,* the great king over all the earth. Come, let us worship* and fall down before Christ. Troparion, Tone 4: You ascended in glory, O Christ our God,* giving joy to Your disciples by the promise of the Holy Spirit,* and assuring them through your blessing* that You are the Son of God,* the Redeemer of the world. 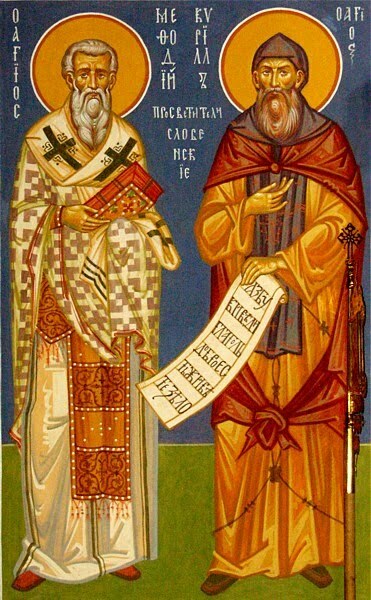 Troparion, Tone 4: As equals to the apostles in the way you lived* and teachers of the Slavic lands,* O Cyril and Methodius, divinely wise,* intercede with the Master of all* to confirm the Slavic nations in orthodoxy and oneness of mind;* to grant peace to the world and save our souls. Kontakion, Tone 3: Let us extol our two sacred teachers. * By their translation of Scriptures* they tapped for us a well that brings knowledge of God. * Drawing from it abundantly to this very day* we call you blessed, O Cyril and Methodius. * As you stand before the throne on high,* fervently pray to God to save our souls. Kontakion, Tone 6: When you had fulfilled Your plan for us* and united things on earth with those in heaven,* You ascended in glory, O Christ our God,* in no way distant, but remaining in separable,* You cried to those who love You:* I am with You and there is none against you. Be exalted, O God, above the heavens;* above all the earth be Your glory. O my soul, magnify the Lord who in glory ascended bodily into the heavens. And the Irmos: O Mother of God,* you transcended both mind and word,* and in time, ineffably bore the Timeless One:* it is you who, with one accord,* we, the faithful, magnify. Be exalted, O God, above the heavens, above all the earth be Your glory.